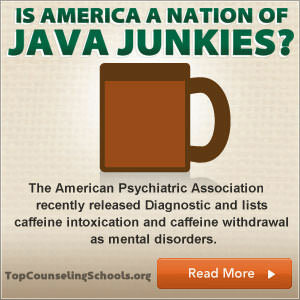 The American Psychiatric Association’s recently released Diagnostic and Statistic Manual of Mental Disorders (DSM-5) lists caffeine intoxication and caffeine withdrawal as mental disorders. Amazing, but true: Some substance abuse clinics already view caffeine as a potentially hazardous substance and do not allow patients or employees to bring the contraband into the facility. Never mind all that: How much do Americans love coffee? 83 % of adults drink coffee in the U.S., the world’s biggest consumer of the beverage, up from 78 percent a year earlier. 300 mg: the average amount of caffeine adult consumes per day. 74 % of Hispanic-Americans drink coffee daily, 12 percentage points ahead of non-Hispanics. How do we like to drink it? 3,487 gallons: largest cup of coffee, created by De’Longhi (Italy), in London, UK, on November 5, 2012. Black coffee was used and the cup measured 9 ft 6 in. tall and 8 ft 8 in wide. Benefits include alertness and attention, boosting metabolic rate, and reducing heart disease and diabetes risks. Can extend the lives of people who drink it daily, according to researchers at the National Cancer Institute. $18 billion: Total amount of yearly money spent on specialty coffee in the U.S.
2. 82 cups of coffee in 7 hours: the world’s drinking record. 3. Coffee was so scarce in Germany that during WWII, “coffee bombs” or bags of coffee were dropped from planes to turn the people against their government. 4. There’s a tourist agency for people wanting to take coffee vacations called Cafe Away. 5. Finland drinks the most coffee per person. The United States is ranked number 12. 6. The only place where coffee is grown in the United States is Hawaii. 8. $47.30: price of a Starbucks’ Quadriginoctuple Frappe.